What happens when intuitive decision-making and perfect timing come together? A creative life filled with abundance and joy! 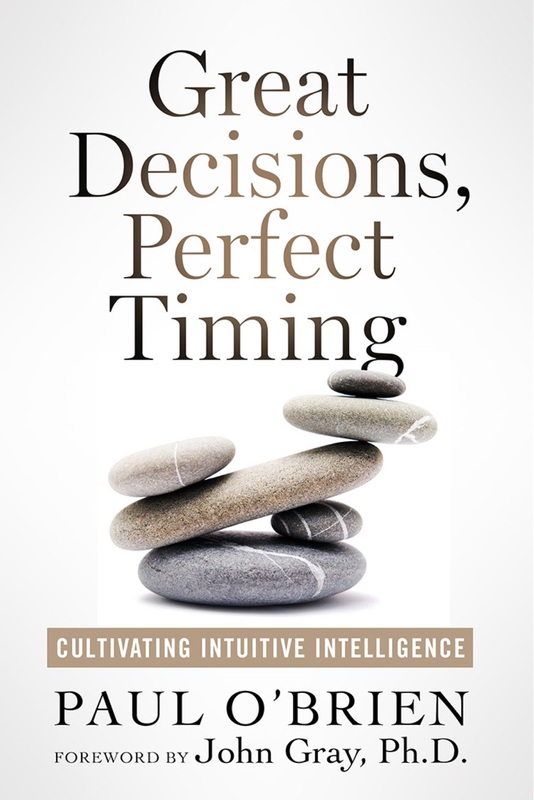 With Great Decisions, Perfect Timing--Cultivating Intuitive Intelligence, you too can learn how to cultivate intuitive intelligence for better decisions and less stress in life, love and business. Scroll down to read excerpts and learn more about Visionary Decision Making, Synchronstic Living and the book! What happens when intuitive decision-making and perfect timing come together? The answer: A creative life filled with abundance and joy. What happens when intuitive decision-making and perfect timing come together? What do you get when you make the right moves at the right time? Answer: A creative life filled with abundance and joy. Scroll down for more about the book! "If you have ever watched in envy those people who seem to operate from a clear sense of inner knowing (what Paul O’Brien calls intuitive intelligence) and consistently manifest their dreams, envy no more. In his exciting new book, O’Brien lets the reader in on the power of Visionary Decision Making and shows exactly how to harness that inner guidance that intuitively ‘knows’ the elegantly effective ways to proceed, whatever your endeavors, and is, moreover, aligned with the greater good." "A toolkit to help you put the power of synchronicity, archetypes and infinite intelligence to work for you – so that you can more fully enjoy happiness, success and, of course, love!" "Paul has graced us with a wonderful blend of optimistic perspectives and practices so we can contact our own inner wisdom. This book shows, simply and meaningfully, how synchronicity offers us a path to becoming psychologically healthy and spiritually awake." Discover and share some of your own amazing synchronistic experiences. On sale February 19, 2015 -- Chinese New Year! How to not only notice synchronicities, but leverage them. Synchronicities offer a unique opportunity to receive information from the realm of Infinite Intelligence that Jung called "the collective unconscious." How to tune into our collective resource of "Infinite Intelligence." Infinite Intelligence surrounds us; it is available to everyone; it is the origin of all great ideas and a resource of creative powers. How to fine tune your intuitive antenna. Intuitive mindfulness creates space for the intuitive sense to operate freely—turning down the noise level of the other senses, allowing for better reception of subtle insights and synchronistic signals. How to discover your most creative self. Focus on what fascinates you, that which engages your aptitudes and natural temperament. Understand your true nature and align yourself with your destiny. How to master strategic thinking and tap creative resources. Harness archetypes and the I Ching as intuitive decision-making aids. Learn how to find the right kinds of mentor, counselor or guide. Employ logic to your strategic advantage while letting intuition creatively point the way. How to upgrade your beliefs. Be clear about what they are and take ownership of your current operating assumptions. Be willing to put them to the test. Adopt only the beliefs that make sense to you—because your attitude, decisions and actions depend on them. How to execute decisions in order to make the right moves at the right time. Perseverance furthers as you develop mastery. Like compound interest, even slightly better decisions will add up to incredible benefit over time. Visionary decision making and the development of a “synchronistic lifestyle” are potentials that are accessible to everyone—highly idealistic but eminently practical—and the practices present in the book are easy to learn. It all begins with awareness and ends with execution. A positive outlook, faith in your purpose and an activated intuition ensure that Great Decisions and Perfect Timing become standard operating procedure in your life. Contact us to request a copy of the book or for an interview (and let us know where your stories or reviews will appear). Interviews Q & A - Interview questions regarding Visionary Decision Making and the perfection of timing—for print, radio and TV interviews. 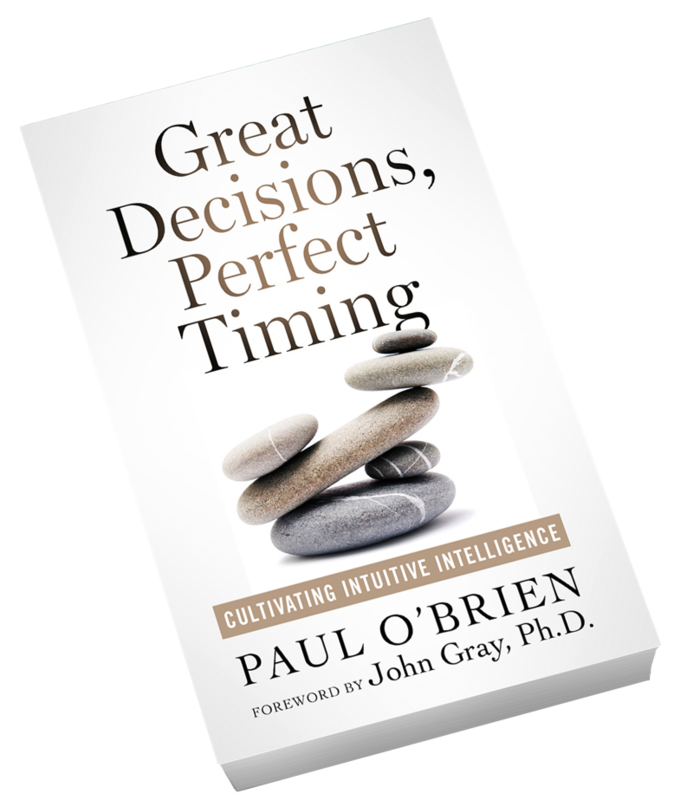 Press Release: Visionary Entrepreneur Paul O’Brien Releases Anticipated New Book on Intuitive Decision Making. My Decision Maker's Corner archive of Paulo's blogs related to personal and cultural transformation. Paul O’Brien is most famous for inventing the divination software category with his development of the Synchronicity I-Ching program in 1989. This evolved to eventually become the world’s largest astrology and divination website (Tarot.com), which was acquired by a large media company in 2007. He is the author of three books Great Decisions, Perfect Timing: Cultivating Intuitive Intelligence; Divination: Sacred Tools and The Visionary I Ching (a modern version of the ancient oracle). 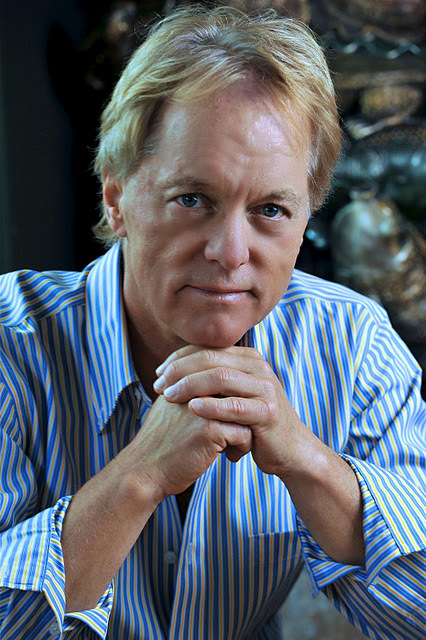 Paul has been the host of Pathways, a radio interview program focused on personal and cultural transformation for 30 years. For more information about The Visionary I Ching and other tools for intuitive decision-making visit http://www.Divination.com.